Dear friends, apologies for my long silence, immersed as I am in the daily duties of an old doddler on the Garden Path. You know how it is with one red herring replacing another until there are altogether too many fish to fry. I may be a puppet jerked round on the strings of possibility without an iota of certainty anywhere in sight but at least I’m caught up on my reports. If story sequence matters to you, please scroll down to the footprints of the Buddha at the bottom of the home page and follow them, entry by entry, up to the present. You will then be fully briefed on my travels and travails, journeying backwards with me into the future. Last week I was in Colombo working with various digital printing firms on two toys, the Labyrinths and the Amma Appa Wheel of Life. Colombo is very expensive now, especially accommodation, so I beat a hasty retreat. At the moment I’m staying in Batticaloa at Monkey’s Tale. We are preparing for two workshops featuring Masks, Puppet Ladders, Kolams and the House of Peace next week. Work on the toys continues, as does preparation of containers fabricated from cardboard covered with printed cloth. Everything takes time and skilled workers are hard to come by these days mainly because the ten-day Mamangam festival, the most important temple festival of the year in these parts, commands everyone’s attention. Mamangam is reputed to be the place where Rama first set foot when he came to Lanka looking for his beloved Sita who had been abducted by Ravana, the dark and turbulent lord of those times. Some believe Ravana and his rakshasa demons still rule Sri Lanka in the form of its present day politicians. It is also held by many that Ravana is not all bad. Whatever, the country is awash in myth, both ancient and modern. Next week there will be an important parliamentary election which has everyone but the crows, the dead fish and me holding his breath. Every morning I put out water and food scraps for the crows who are regular visitors at Monkey’s Tale and my chief source of entertainment. This is the hottest time of year and the crows are dying of thirst. Yesterday they found a dead fish somewhere and brought it by in pieces to wash in their drinking bowl on the front rotunda, no doubt a well-intended offering. Not even the pungent aroma of Indian incense, however, could mask the stench of this fetid, far gone fish. I had to turn the water bowl over temporarily till the crows took the fish away. One crow hung back in the mango tree. She had the gift of teleportation and carried me back in memory to the Jayanthan’s ‘Jamboree’ last month. Jayanthan was among the first animators in the Butterfly Garden back in 1994. He married, moved to la Beauce with his French Canadian wife Claudie, and was now back visiting his Batticaloa family. He invited all his old Garden friends back together at Fr. Paul’s family home in Kalkudah for a sea bath and celebration. Crow was there and among the things she overheard that day was the following conversation. There have been big changes at the Garden over the past few years. Donors give program money but nothing for development of the spirit of the Garden as they did in the past. We need funds, of course, but the criteria that now apply to decide who gets funding are intrinsically opposed to the spirit of our Garden Path ways. We have a lot of programs for children, from the smallest kids to high school youth but funders allocate very little for program preparation. There is the no fulfillment in this way of working for the animators. It produces barren programs. In the beginning, in different and much more difficult times of war, we were happy in the Garden. Now there is peace but everyone is disturbed and depressed. We are disturbed by the constant search for money. It’s all we do besides offer the most basic activity programs. “Enterprise” is the funder buzzword these days. We must find funds within our own skill set. Go to local community-based funders. Private companies can also be approached. Small factories have grants for community development. This means adjusting everything we do just to meet basic needs. We will never be what we once were. Funding from the private and public sector as well as from local and international NGO’s take organization and that in itself takes money. So we’re back where we started. This is the conundrum facing my Garden friends these days and I’m hard-pressed to know how to help. The Out-of-the-Box Curriculum may provide an enterprise solution in the future but it presumes the Monkey’s Tale Centre re-opens and remains operational as an educational centre, which seems doubtful at present. In the meantime there is the shade of the old mango tree where I often sit and ponder. The mangoes are ripe and falling these days so I have to wear my pith helmet and carry a fly swatter. The sweet fruit attract various beetles, butterflies, birds and mango pluckers from the Singhalese border villages. Yesterday a truck stopped and negotiated with Kula to pick the tree clean, paying us R’s 1500 (CDN $15) for the harvest which they will make into jam. The rotting mangoes they didn’t take are sitting on the garden wall, a putrefying confection for butterflies, mynahs, magpies and squirrels to enjoy. Dusk has fallen. Day is done. King Crow comes for his bath. He squawks me a rude goodnight. 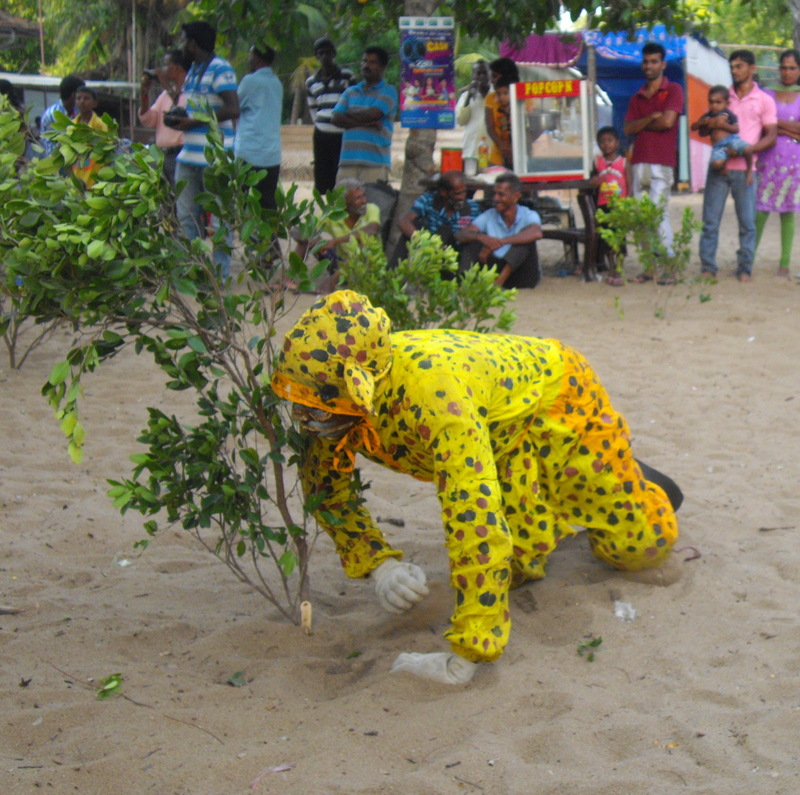 Later I will go to Mamangam to see Nattu Kuthu, the traditional dance of Batticaloa, performed by a troop from the village of Makulavettvan where the tradition dates back to ancient times. Yesterday I witnessed the Puli Kuthu (Tiger Kutu) performed by a troop of Veddah players from Vakarai. 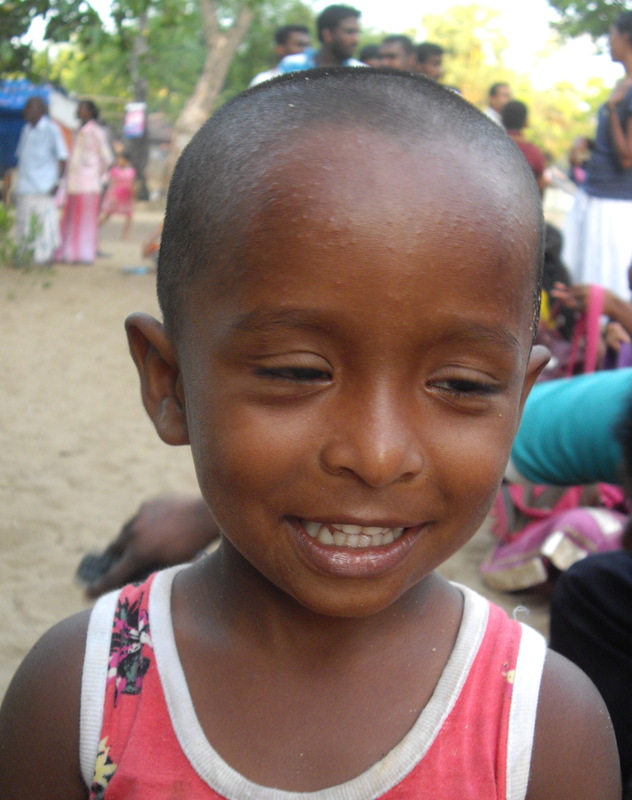 These are the indigenous people of Sri Lanka. A small boy of three or four years with a clean-shaven head joined me out of nowhere seeking protection from the tiger. Not a bad idea since the tiger boldly stalks the audience repeatedly lunging into its midst with a ferocious growl but never once accosting me, though he brushed close on one occasion with the lad ducking nimbly behind me to hide. Soon his siblings, cousins and friends gathered round to ask all sorts of questions while I tried desperately to take pictures of the tiger hunt in the dark with my broken Pentax. “What color is my skin? The adolescent boy who asked this last question was wearing a black t-shirt inscribed with the English phrase “The soul cannot live without you” in flowing green script on the front. Of course he had no idea what these words mean nor the meaning of the words inscribed on the back of the t-shirt in invisible ink, “You cannot live without the soul”. I asked whether his mother and father were with him. He told me he lost his father. He didn’t say how. On August 14, the last day of the festival, Addai Ammavasai, under a new moon, boys like him with no fathers will come to bathe in the lotus pond receiving the blessing and protection of Lord Siva. As I write I hear the evening call to prayer from a nearby mosque, but also vying for my attention are the frenzied drums of an approaching processional band playing a Tamil version of When the Saints who now come, not marching but dancing into view down Pioneer Road right in front of the studio, small girls whirling and bowing in silver and red fairy dresses, boys prancing up and down in princely rocking horse regalia. Kula comes rushing down the street and into the gate beckoning me to come without delay to witness the spectacle. 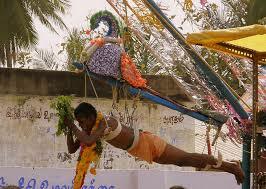 I don’t want to miss the saints and especially the Paravai Kavadi, which takes up the rear of the parade. A fisherman, hanging above the gathering crowd by hooks impaled in his back and legs, swings horizontally from a ladder rigged up in front of a tractor. He carries a spray of margosa leaves in both hands, moving his arms hypnotically up and down like a bird flying off in the night. Tomorrow morning at the break of day I expect to see him return with the crows as I fill their bowl with fresh water and prepare flower offerings for our dear deranged world suspended precariously above in the heavenly mango tree.